In this section of the User Guide we will discuss how to use the Learning Management System, as well as how to add instructors and create courses, lessons, questions, and quizzes. In order to enable purchasing of courses via WooCommerce, you need to navigate to WooCommerce> Settings > Checkout and disable the "Enable Guest Checkout" option. In order to enable user registration, you need to navigate to Settings and enable the "Anyone can register" option. 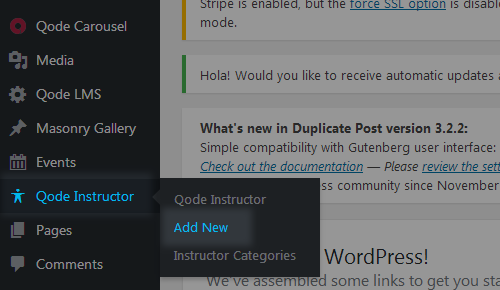 Navigate to Qode Instructor > Add new from your WordPress admin panel. Enter the Instructors name in the text field near the top of the page. On the right side of the screen are the Instructor Categories, and Featured Image sections. In the Instructor Categories section, you can assign the instructor to a category. 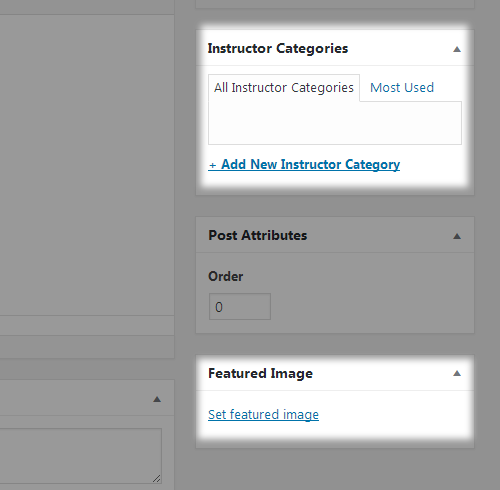 In the Featured Image section, you can set an image to be displayed for this instructor. Title - Input a title for this instructor. Brief Vita - Input a short resume for the instructor. Email - Input this instructors email address. Resume - Upload the instructors resume. Social Link - Add social links for this instructor. 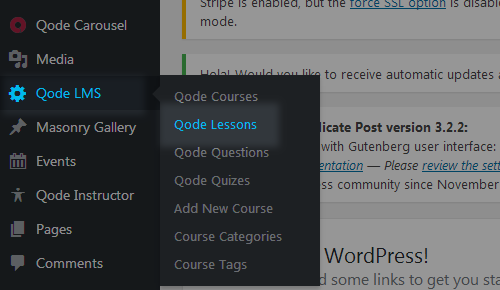 Navigate to Qode LMS >Qode Lessons from your WordPress admin panel. Enter a title for the lesson in the text field near the top of the page. You can add content to the lesson the same way you add content to your pages and blog posts. Navigate to Qode LMS>Qode Questions from your WordPress admin panel. Enter a title for the question in the text field near the top of the page. Question Description - Input a description for this question. Question Type - Choose the type of question you would like to create. Depending on the type of question you choose, you will be presented with a set of fields in which you can input the answers to your question and set up which answer or answers are correct. Question Mark - Input the mark that is given to the student for answering correctly. Question Hint - Optionally, input a hint that will help the student answer the question. Navigate to Qode LMS >Qode Quizzes from your WordPress admin panel. Here you can add questions to your quiz. To add a question, click the "Add Question" button and then choose the question you would like to add. Quiz Description - Input a description for the quiz. Quiz Duration - Input a duration for the quiz. Quiz Duration Parameter - Choose whether the duration will be in seconds, minutes, or hours. Number of Retakes - Choose how many times a student can retake this quiz. Passing Percentage - Choose what percentage of answers the student needs to answer correctly in order to pass the quiz. Quiz Post Message - Input a message that will be displayed to the student after they complete the quiz. 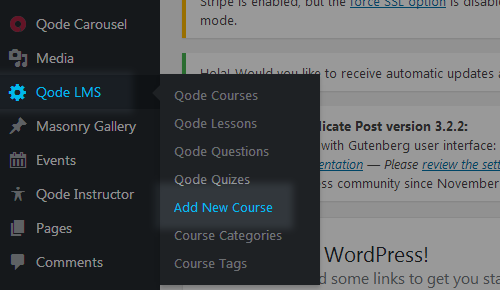 Navigate to Qode LMS > Add newCourse from your WordPress admin panel. Enter the name of the course in the text field near the top of the page. You can input a description of the course in the content field near the top of the screen. Anything you input here will be displayed in the Description tab of the course. Show Title Area - Set this option to "Yes" if you would like to display the title area on course pages. Course Instructor - Choose an instructor for this course. Course Duration - Set a duration for the course. General Curriculum Description - Input a description of the course curriculum. Course Duration Paramater - Choose whether you would like the course duration to be in minutes, hours, days, or weeks. Maximum Students - Input the maximum number of students that can attend this course. Number of Re-Takes - Input how many times a student can retake this course. Featured Course- Set this option to "Yes" if you would like to mark this course as featured. Pre-Required Course - If there is a course the students should complete before taking this course, choose that pre-required course here. Passing Percentage - Choose what percentage of the course the student has to complete to get a passing grade. Free Course - Choose whether this course will be free or not. Price - Input the price for the course. Discount - Input a discount value for the course. In this section you can create the curriculum for your course by creating sections in which you can add your previously created lessons and quizzes. You can use this shortcode to display the key features of a single course. Selected Course - Choose a course to display. Show Course Duration - Set this option to "Yes" if you would like to display the duration of the course. Show Course Units - Set this option to "Yes" if you would like to display the course units (lessons and quizzes). Show Course Students - Set this option to "Yes" if you would like to display the max number of students for this course. Show Course Passing Percentage - Set this option to "Yes" if you would like to display the required passing percentage for the course. Show Course Maximum Retakes - Set this option to "Yes" if you would like to display the maximum number of times a student can retake this course. You can use this shortcode to display a list of your courses. Number of Columns - Set the number of columns in which you would like to display your course list. Space Between Courses - Choose a spacing between course items in the list. Number of Courses Per Page - Choose how many courses you would like to display per page. Enter "-1" do display all courses on a single page. Enable Image - Set this option to "Yes" if you would like to display the featured images of your courses. Image Proportions - Choose the proportions of the images in your course list. One-Category Course List - If you would only like to display courses from a single category, enter the category slug in this field. Show Only Courses with Listed IDs - If you would only like to display certain projects in your course list, enter the IDs of those projects in this field. One-Tag Courses List - If you would like to display courses with only a certain tag attached to them, you can enter the tag here. Order by - Choose how you would like to order your course items. Item Style - Choose a style (layout and hover type) for the items in your course list. Enable Title - Set this option to "Yes" to display the course titles in the list. Title Tag - Choose a heading tag for the titles in your course list. Title Text Transform - Choose a text transform style for the title. Enable Instructor - Set this option to "Yes" if you would like to display the name of the instructor. Enable Price - Set this option to "Yes" to display the prices of your courses. Enable Excerpt - Set this option to "Yes" to display the excerpt on your course list. Excerpt Length - Set a maximum number of characters to display in the excerpt. Enable Students - Set this option to "Yes" if you would like to display the maximum number of students for this course. Enable Category - Set this option to "Yes" to display the categories on your course list. Pagination Type - Choose a pagination type to use. Load More Top Margin - Set a top margin for the "Load More" button when using the "Load More" type of pagination. Enable Filter - Set this option to "Yes" to enable a category filter above the course list. Enable Article Animation - Set this option to "Yes" to enable a content entry animation for projects in your course list. You can use this shortcode to display your courses in a slider layout. Number of Columns - Set a number of courses that will be displayed at the same time in the slider. Space Between Course Items - Set a spacing between course items in the slider. Image Proportions - Set proportions for your course featured images. One-Category Course List - If you would only like to display course from a single category, enter the category slug in this field. Show Only Courses with Listed IDs - If you would only like to display certain projects in your course slider, enter the IDs of those projects in this field. One-Tag Course List - If you would like to display courses with only a certain tag attached to them, you can enter the tag here. Enable Title - Set this option to "Yes" to display the course title in the slider. Title Tag - Choose a heading tag for the titles in your course slider. Title Text Transform - Set a text transform style for the title. Enable Category - Set this option to "Yes" to display the category in your course slider. Enable Slider Loop - If you would like the slider to loop when it comes to the end of the course list, set this option to "Yes". Enable Slider Autoplay - Set this option to "Yes" if you would like the slider to automatically change slides. Slide Duration - Set a duration time (in milliseconds) for each slide to stay on screen before switching to the next slide. Slide Animation Duration - Set a duration time (in milliseconds) for the animation between slides. Enable Slider Navigation Arrows - Set this option to "Yes" to enable slider navigation arrows. Navigation Skin - Choose between a dark and light skin for the navigation arrows. Enable Slider Pagination - Set this option to "Yes" to enable pagination bullets on the slider. Pagination Skin - Choose between a dark and light skin for the pagination. Pagination Position - Choose a position for the pagination bullets. You can use this shortcode to display an advanced search form for courses on your website. Enable Category - Set this option to "Yes" if you would like to let users search by category. Enable Instructor - Set this option to "Yes" if you would like to let users search by instructor. Enable Price - Set this option to "Yes" if you would like to let users search by price. Button Text - Input the text you would like to display on the button. Button Type - Choose a type of button to use. Button Size - Choose a predefined size for the button. Button Color - Set a color for the button text. Button Hover Color - Set a hover color for the button text. Button Background Color - Set a background color for the button. Button Hover Background Color - Set a hover color for the button background. Button Border Color - Set a border color for the button. Button Hover Border Color - Set a hover color for the button border. You can use this shortcode to present a list of your courses in a table layout. You can use this shortcode to showcase a single instructor. Instructor Layout - Choose a layout for the instructor. Select Instructor - Choose an instructor to display. You can use this shortcode to display a list of your instructors. Number of Columns - Set the number of columns in which you would like to display your instructor list. Space Between Instructors - Choose a spacing between instructors in the list. Number of Instructors Per Page - Choose how many instructors you would like to display per page. Enter "-1" do display all instructors on a single page. One-Category Instructor List - If you would only like to display instructors from a single category, enter the category slug in this field. Show Only Instructors with Listed IDs - If you would only like to display certain instructors in your instructor list, enter the IDs of those instructors in this field. Order by - Choose how you would like to order your instructors. Instructor Layout - Choose a layout for the items in the instructor list. Number of Columns in Row - Set the number of columns you would like to display in the slider at once. Space Between Instructors - Choose a spacing between instructors in the slider. Enable Slider Navigation Arrows - Set this option to "Yes" to display navigation arrows in the slider. Enable Slider Pagination - Set this option to "Yes" to display pagination bullets on the slider. Instructor Layout - Choose a layout for the items in the instructor slider.